The University of Chicago Institute for Translational Medicine (ITM) recently welcomed Kristin Bergsland, PhD, as the new laboratory director of its Clinical Research Center (CRC). Bergsland, who also works as a research associate in UChicago’s nephrology section, supervises the CRC’s core laboratory, managing and providing its many specialized services to researchers. 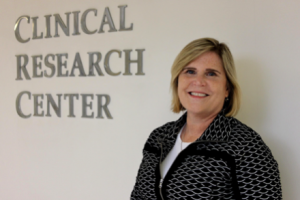 She oversees the nuanced logistics of clinical studies so that human subject research conducted in the CRC yields precise, high-quality results. The CRC is a one-stop shop for human-subject research studies. The 55-year-old center provides the space, services, resources and expertise for investigators to conduct their research, a convenient alternative to finding those services in several different places. As laboratory director, Bergsland ensures investigators have access to the services applicable to their project, ranging from diet analysis software to expert lab technicians. Her oversight allows investigators to more easily and efficiently organize their human-centered research, an often challenging undertaking given that the services she provides are usually hard to find in one place. Beyond simply connecting investigators with the right resources, Bergsland is well-versed in the logistical side of health research. After earning a PhD in microbiology from Michigan State University, she worked at several biotechnology companies, including Fermalogic, Inc. and Litholink, as a research scientist and clinical lab manager. In 2006, she transitioned to UChicago’s nephrology section to study kidney stones, where she continues to work today. In April of 2016, Bergsland joined the CRC team as its lab director. Because of her background in clinical research, Bergsland said she appreciates the attention to detail necessary to conduct studies with precise, high-impact results. From understanding how to process, package, and measure specimens to her fluency in medical terminology, Bergsland has the know-how to see these studies through from start to finish. Bergsland is excited to be a resource for investigators and help develop and execute studies whose results will go on to improve the lives of many around the world. To learn more about the CRC or connect with Bergsland, contact her at kbergsla@medicine.bsd.uchicago.edu.